The Tanner Lectures on Human Values, founded July 1, 1978, at Clare Hall, Cambridge University, was established by the American scholar, industrialist, and philanthropist Obert Clark Tanner. Lectureships are awarded to outstanding scholars or leaders in broadly defined fields of human values and transcend ethnic, national, religious, or ideological distinctions. 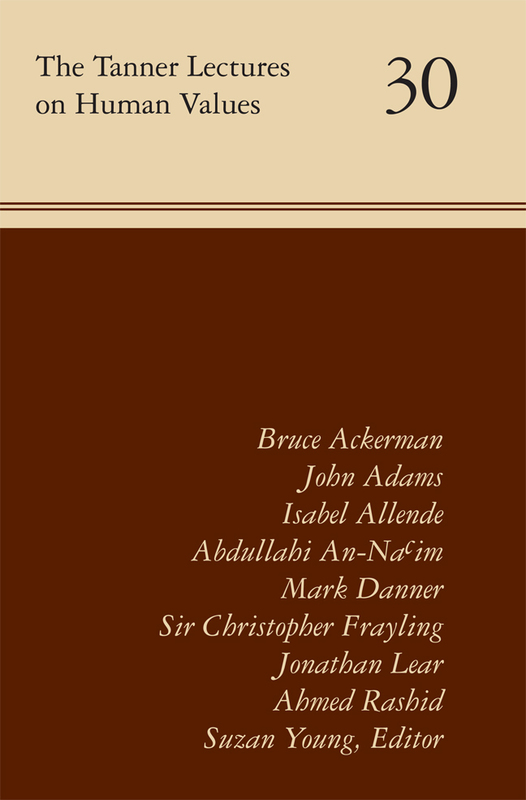 Volume 30 features lectures given in 2010 at Princeton University; Yale University; the University of California, Berkeley; the University of Utah; Stanford University; Clare Hall, Cambridge University; Harvard University; and Brasenose College, Oxford University. Bruce Ackerman is Sterling Professor of Law and Political Science at Yale and the author of fifteen books that have had a broad influence in political philosophy, constitutional law, and public policy. John Adams is a musician, composer, writer, and conductor whose work stands out for its depth of expression, its sonic brilliance, and the profoundly humanist nature of its themes. Isabel Allende is a social activist and feminist whose novels and memoirs have established her as one of the most res-pected writers of our time. Abdullahi Ahmed An-Nacim is the Charles Howard Candler Professor of Law at Emory Law School and an internationally recognized scholar of Islam and human rights in cross-­cultural perspectives. Mark Danner is a writer, journalist, and professor who has written for more than two decades on foreign affairs and international conflict. Sir Christopher Frayling is a historian, critic, and an award-winning broadcaster on British network radio and television. He has written seventeen books on the arts and popular culture. Jonathan Lear is the John U. Nef Distinguished Service Professor at the Committee on Social Thought and the Depart-ment of Philosophy at the University of Chicago. His research and writings focus on philosophical conceptions of the human psyche. Ahmed Rashid is a reporter from Pakistan whose unique knowledge of this complex region allows him a panoramic vision and nuanced perspective that no Western writer can emulate.